You already know that emergency situations build up agitation and stress. In itself, stress is helpful since a lot of factors that produce stress are actually very important for keeping yourself stimulated. The Canadian scientist Hans Selye is the author of the theory of stress. He says in his book: “Total absence of stress brings death”. If our bodies don’t get stimulating stress, certain functions begin to deteriorate and fail. That’s why people cannot and should not completely avoid stress because it serves a purpose. But in situations when stressful factors are so strong that they cause distress or suffering, it become counterproductive. To clarify his position to the notion “distressing” the Swedish scientist Leonard Levi offered another term – eustress (the preffix “eu” meaning “good or friendly”). So we have categories for all the different things that can impact our bodies. All kinds of impacts are called stresses. if they are benefical they are called eustress. Any emergency situation is associated with not just stress but distress. Thus, we need to learn how to protect ourselves from distress to be able to make decisions quickly. Not everyone knows that nature grants us the power of autoregulating ourselves. Being able to use these mechanisms is a great advantage when struggling with distressing factors. Everyone should learn to make use of these abilities. In other words, anyone who doesn’t want to end up a victim of unfortunate circumstances helped along by our complicated and strained reality should learn to control himself, his psyche and his physiological state. For many people this presents a challenge even in everyday life, not to mention extreme cases. 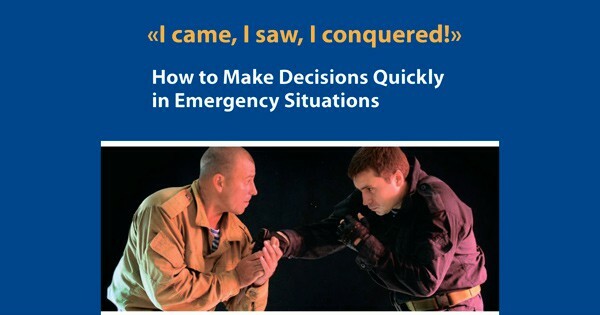 Besides being in a state of overexcitement, in this case meaning distress, a person in an emergency situation will have no time to make a decision. You may have just one second to make the right decision. This is according to an expert from a security business and his words explain the importance of the time factor in an emergency situation. We don’t even realize the importance of the time factor when a person’s life or health is at stake. Maybe the movies and sport martial arts warped our idea about how things happen during fierce fights. This is the question: how much time do you think passed wherein these two people died? Three and a half seconds. Everything happened withing 3.5 seconds. The range of experiments done by American scientists is known all over the world. In this particular experiment people were shown the face of an African-American man on the screen. And then they were shown a gun and a pipe wrench in a different sequence. Within the timespan of the test, people mostly gave the right answers. They called the gun – a gun and the pipe wrench – a pipe wrench. After this the conditions were changed. They showed the picture on the screen for the same amount of time, 200 milliseconds, after having reduced the time for the answer to 500 milliseconds, which is half of a second. As a consequence of the limited amount of time, the test group became agitated. They were obviously distressed. They stopped using the information their senses provided them with and resorted to basing their answers upon stereotypes. Thus a person with little training who has to make split second decisions follows preconceived notions and prejudices demonstrating instinctive reactions, of the lowest denominator. Does it mean we should accept the impossibility of making correct decisions instantly in an emergency situation and accept mistakes as something inevitable? Of course not. Because any of these mistakes could cost you your life. From a certain perspective, our instinctive thinking is similar to conscious thinking: in both cases we can develop our abilities of making quick decisions using our skills and experience. Even short-term training can fundamentally change a person’s behavior in an emergency situation. 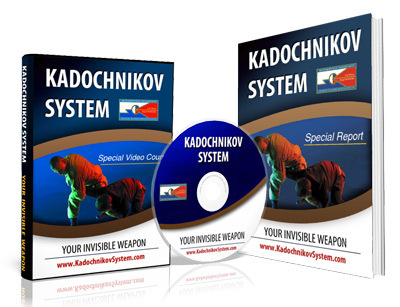 In the Kadochnikov System people work in conditions that are very close to real life. Instead of working on smooth covering, there is a hard floor, then a bench and then stairs and so on. All items and weapons are real, there are no imitations here. 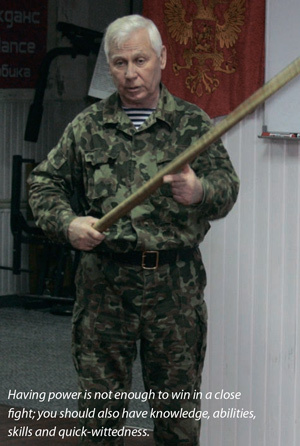 Note that we start working with weapons right away without any preparatory periods. In real life, nobody is going to ask you what have you already know and what you’re about to learn. We always assume the worst: the opponent is stronger, faster, he’s not alone and outnumbers you, he is armed and so on. 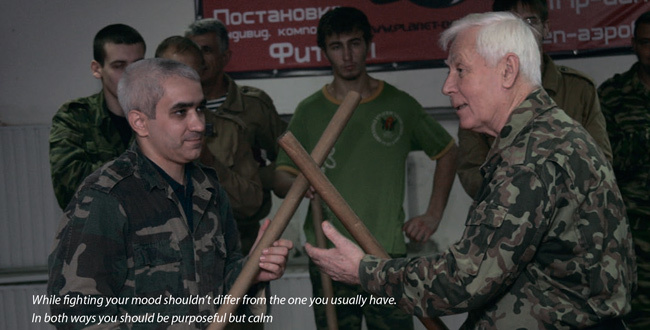 The regular seminars that we run 2-3 days are attended by people who have no training at all: many of them not only never did martial arts but also don’t do morning exercises. No wonder that the risk of being attacked makes them feel scared and helpless. They want to obtain at least some skills that give them an approximate idea what to do when they’re attacked. They change right after the first seminar. To their amazement they discover that their body can do a lot of things. They can move easily while they’re in the lying position, release themselves from holds by the arms, chest, neck, can protect themselves from blows not just from sticks but also from automatic weapons. After realizing that, even if you have no time to react properly and avoid the opponent’s hit fully but you manage to change its trajectory, it will weaken and people stop panicking over getting out of its way. After doing special exercises with a partner in which they throw knives over to each other practicing defenses from attacks with knives isn’t so scary. Moreover, at first these exercises are performed slowly to help you realize every motion and avoid performing them mechanically. And we already know that automatic, learned by heart movements don’t work in dangerous situations. You should understand that using the principle of leverage allows you to increase your strength several times over if you manage to find the point on which your opponent is supported. And there is more. It looks as if the moment of inertia, the couple of forces and the principle of Dinamo are not just abstract notions but are lifelines that, if anything, will help you protect yourself and hold your own in the face of danger. In two or three days, people change completely, not in appearance but inwardly. He or she becomes more confident and less anxious. Of course they are not ninjas, but won’t let anybody abuse them. Even this initial training can change a lot in your life. There are more complex courses for people whose lifestyle predisposes them to find themselves in dangerous situations more often than the average person. Since we can’t present you information from our scientific researches we will illustrate it with examples from other sources. For instance, many sources describe experiments in which bodyguards are trained to be able to handle themselves against dogs. Someone calls the bodyguard and says, “Come here, I heard a noise behind the house”. The bodyguard comes around the corner… and faces an angry dog. For the first time his heart rate jumps up to 175 beats per minute. He can’t analyze the situation properly and fails to carry out the task. But the second and third time, his pulse is about 120-130 b.p.m. And by the fourth or fifth time, his pulse is about 110-115 b.p.m and he manages the dog with confidence. The same effect can be achieved working in other situations: sound of shooting, height, depth and so on. 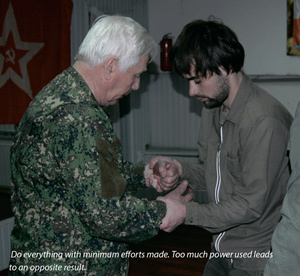 You will be at an advantage if you have any special training or skills and experience that help you cope with any situations including emergency cases. and control your body to the fullest possible extent. We would be grateful if you left your comment about this article. 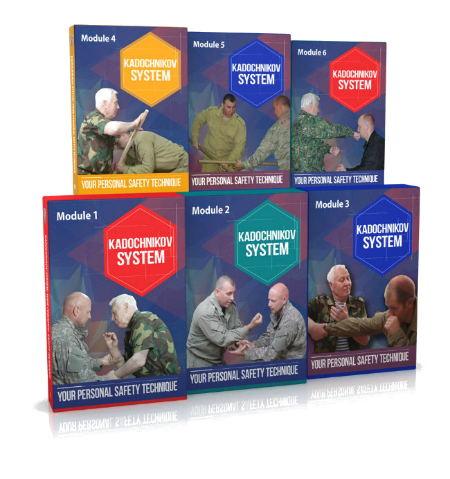 If you’re looking for a simple and reliable system of personal development for raising the safety of your life, your health level and mental stability suitable for anyone of any age, check out our new videotraining – Kadochnikov System. The Secret Formula Of Effective Self-defense. Your Personal Safety Technique.